I do not have the words to express my sincere gratitude for this incredible honor. It is very personal and emotional for me because of my long love of Bulgarian culture and music. Thank you from the bottom of my heart. See photos of the event on the Sofia University website. A long-time member of the Department of Ethnomusicology at the UCLA Herb Alpert School of Music, Dr. Rice has published numerous articles and books in his field. Among these contributions are his books May it Fill Your Soul: Experiencing Bulgarian Music (Chicago, 1994) and Bulgarian Music: Experiencing Music, Expressing Culture (Oxford, 2003). 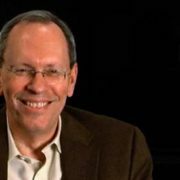 We at the Center for World Music are proud to have Dr. Rice as a member of our Board of Directors. The Center for World Music would like to welcome Marie Hayes to our family of outstanding teaching artists in residence, joining our World Music in the Schools program. Marie Hayes has been singing Balkan harmony music ever since she attended a Kitka Women’s Vocal Ensemble concert in Oakland in 1990. There were ten woman on the stage, elbows linked in a semi-circle, singing the most captivating music she had ever heard. She was also struck by the rich, refined choral style of Le Mystère des Voix Bulgares, whose music initially amazed her. Ultimately, it was this exciting and expressive nature of the “village voice” sound that drew her in. It wasn’t long before she found friends in San Diego who wanted to join her. Their quartet, Harmonija, whose motto was “Harmony Music from the Balkans and Beyond,” entertained people for the next decade. They performed at coffee houses and parties, and gave many concerts for San Diego Folk Heritage, often teaching workshops at that organization’s annual music festival. 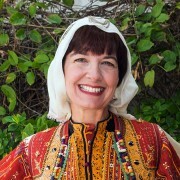 Marie performed for ten years singing and playing percussion with Eastern Exposure, a Balkan dance band that played live music for folk dancers all over Southern California. She has recently formed a new a cappella vocal group, Trio Zheni, with singers Mary Ann Downs and Stacey Barnett. As a teacher of Balkan singing, Marie’s main goal is to help students learn to listen to each other and work together to produce a sound they can be really proud of—and feel the thrill of hitting a perfect chord that makes the whole room ring. Marie takes workshops and private lessons regularly from world-renowned singing teachers sponsored by the Eastern European Folklife Center. 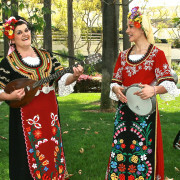 These include Bulgarians Donka Koleva, Tatiana Sarbinska, and Iliana Božanova, UCLA Balkan Choir Director Tsvetanka Varimezova (and her daughter Tanya), Bosnian Mirjana Lausevič, and Macedonian Esma Redžepova. She has also studied with American master teachers such as Mary Sherhart and Michelle Simon for Balkan singing, Canadian Brenna MacCrimmon for Turkish singing, Christos Govetas for Greek singing, and Polly Tapia Ferber for doumbek (drum) and frame drum. Because Balkan rhythms are varied and sometimes quite complicated, she finds that a knowledge of drumming is essential. Marie has a degree in sociolinguistics from UCSD, where she also studied music. She has taught English as a Second Language at Miramar College, been a tutor for the Laubach Literacy program, and spent seven happy years as a teacher at Mission Bay Montessori Academy, where she loved teaching music and movement to the preschoolers in her class. An article in an online fashion journal from Bulgaria, with eleven nice videos of Bulgarian folk dance and—most interesting—captions indicating the complex rhythms of each dance. Bulgarian folklore dances are unique with their asymmetrical meters, combining “quick” and “slow” beats. . . . These dance rhythms may not agree with the rhythms and meters performed by the musicians. Read more and view the videos at BGFashion.net. Can you count the beats? Martin Koenig, a good friend of the CWM, has spearheaded an extraordinary project to document disappearing music and dance cultures of the Balkans. His efforts are coming to fruition in the form of recordings (in partnership with Smithsonian Folkways), a book, and exquisite fine-art photographs. Very much worth the attention of lovers of traditional performing arts . . .
After my first visit, I felt an urgency to preserve the music and dance traditions that were disappearing throughout the country. I was driven by the goal of documenting and recording the traditional music and dance of each place I visited, by permanently memorializing them on 16 mm film stock and audiotape. 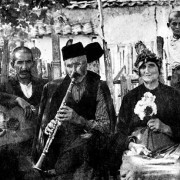 Browse to Balkan Echoes.com, for a look at the photos and book.